I have very important question. If I'll say guilty for this turning on the red light ( not enough time to stop: was just 1.8s). This ticket is going to be on my driving record ? Stanton wrote: No, red light cameras can't identify the driver of the vehicle, so the registered owner is charged. There are no demerit points and no insurance hike associated with it. If you're caught by a police officer going through a red light, you're charged as the driver and will face demerit points and potential insurance rate increases. Slyk wrote: It doesn't really count against your driving record, as far as I know. I think it classifies the same as a parking ticket essentially. So it's more of a money thing, shouldn't affect your insurance AFAIK. I might be wrong, but this is from what I understand. donek wrote: Thanks Slyk, but if someone knows for sure I'll appreciate it !!! Stanton and Slyk are correct. This ticket has no demerit points and does not affect your driving record or insurance... that is, unless you don't pay it. 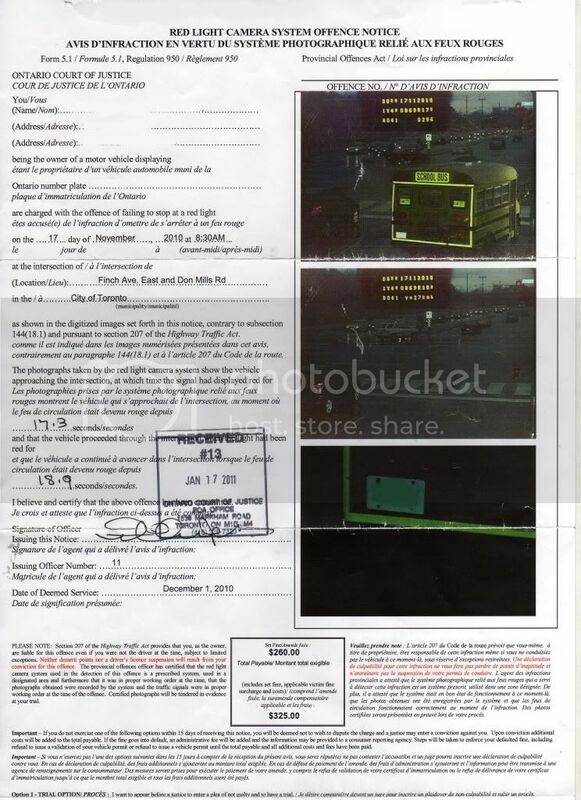 I just got a red light camera ticket regarding intersection (Don Mills & Finch) when I was doing a right turn on red light. It looked to me that i was properly stopped just behind the line in the first photo, and i am totally out of the frame in the second photo. The important question is... can the sensors tell whether you did a Rolling Stop and flag you for that on a right turn? Nothing on the ticket refers to a right turn. It says I was approaching the intersection in the first photo 17.3 seconds after the light was red, and I was out of the intersection 18.9 seconds after the light was red. A complete stop is not defined as the number of seconds at stop. Sounds normal to me, if I stopped properly and then turned. If you look carefully at the pictures you see that car which is turning from east bound of Finch ave. to north bound of Don Mills ave. made in this time almost two lengths of it's size and I was making just short right turn. 1.How far away from the line did it take the photo, Maybe I was already decelerating at Photo 1, (I could have stopped before the picture was taken, crawled closer to see around the other vehicle then gone. For those intersections with red light camera, I don't stop for 3 seconds, never do when there's no car. I just come to a full stop at the white line, then go)? 2.What does the 2 measurements times really mean? What if I had been waiting behind the white line (Picture 1) for like 5 minutes before they took Picture 1 ? 3.How can they even prove that you didn't stop? How can the camera be triggered? I understand how it works if you go straight through the red light. 4.If I will be found guilty, this ticket is going to be on my driving record ? donek wrote: 2.What does the 2 measurements times really mean? What if I had been waiting behind the white line (Picture 1) for like 5 minutes before they took Picture 1 ? The camera triggers if you approach the intersection at greater than 20 km/h, you remain at greater than 20 km/h, and then enter the intersection at the same speed or above. Unless you have a Koenigsegg CXR or Ferrari F40 and hammered the gas at the stop line, or there is a camera malfunction, you will not trigger the camera if you fully stopped. First one means you were behind the stop line going more than 20 km/h. The second means that you fully entered the intersection going more than 20 km/h. donek wrote: 3.How can they even prove that you didn't stop? How can the camera be triggered? I understand how it works if you go straight through the red light. The camera will not activate unless you did not fully stop. If the magnetometers embedded in the roadway sensed your vehicle speed fall below 20 km/h, the camera is deactivated. You could ask to view the camera operator's manual at the Prosecutor's office to get full details on this. Unless you can prove the camera was malfunctioning, your best bet is to ask for a reduced fine. behind the line in the first photo, and totally out of the frame in the second photo. flag you for that on a right turn? Nothing on the ticket refers to a right turn. the number of seconds at stop. Sounds normal to me, if I stopped properly and then turned. I truly don't remember breaking a red light. If you look carefully at the pictures you see that car which is turning from east bound of Finch ave. to north bound of Don Mills ave. made in this time almost two lengths of it's size and I was making just short right turn. the white line, then go)? behind the white line (Picture 1) for like 5 minutes before they took Picture 1 ? 3.How can they even prove that you didn't stop? How can the camera be triggered? I understand how it works if you go straight through the red light but I don't get it how it works with red light right turn? 4.If I will be charge, this ticket is going to be on my driving record, is there some way to fight it back? What possible defenses can I use? possible defenses can I use? 6.Someone told me to ask for evidence that the camera was working properly (maintenance logs, etc. ), but I don't know who I supposed to ask about that. There is not a green arrow for left turns !!! You said that I approach intersection with speed more than 20 km/h and I fully entered the intersection going more than 20 km/h. How is this possible if I was there 1.6 second? With this kind of speed I will disappeared (I think) almost rapidly. Am I right or wrong? You told me to ask for evidence that the camera was working properly (maintenance logs, etc. ), but I don't know if I supposed to ask for that before the court day or on the day of trial? Anyway where is located the Prosecutor's office? . Sorry, I asked too many silly questions but I never before had anything with court and I don't have any idea how this things work. What happened: The camera system sensed your vehicle approaching the stop line at greater than 20 km/h, and then 1.6 seconds later, your vehicle had fully entered the intersection against the red light. That's why there is a 1.6 second difference. What you can do is file a disclosure request (see the "Courts and Procedures" section of this website) asking for the Red Light Camera Manual to help you prepare for the case. You could also ask for "Maintenance Logs and any information concerning repairs or problems with the camera." I don't think you'll get that information, but it is worth a try. Alternatively, the Prosecutor's office is located in the same courthouse where your trial will be held. Just ask for directions and then you can ask if you can see the Camera Manual, or make an appointment to do so. Since this offence will not affect your driving record or insurance premiums, usually the Prosecutor will offer a reduced fine if you plead guilty... then that's the end of the story.